From pumpkin patches and trick-or-treating to corn mazes and flashlight fun, there’s plenty to do with your kiddos this fall season. Put on your favorite costumes and hop in the car to check out some of our favorite fall events this month. Gates open at 9 a.m. and the rodeo starts at 2 p.m. Includes food and arts and crafts. Enjoy hayrides, animals, and navigate your way through the corn maze. Admission is $10-12. There will be a Family Fun Day on October 27 with carnival games, panning for gold, obstacle course, barrel train ride, hayrides, Touch a Truck for $3, Haunted Mansion for $5, and food. Includes a corn maze, pumpkin painting, a petting zoo, hayrides, food vendors, and a children’s zipline. Admission is $10 and free for children ages three and younger. Luckett Farms will offer farm tours, corn mazes, a pumpkin patch, and hayrides. Cost is $12. Mrs. Heather’s Pumpkin patch offers fun activities for you and your kiddos. Along with the pumpkin patch, there will be games, attractions, a petting zoo, and hayrides. In the shadow of the capitol, toast the genius of J.S. Bach and his contemporaries. Bring blankets and lawn chairs for this popular feast for all the senses. Features great food, games, rides, a country store and entertainment. Free admission. There will be a Mini-Pot Jambalaya Cook-off on Saturday at 9 a.m. Free admission. A celebration of Louisiana culture and talent with art, music, and food. Includes vendors, games, kiddie rides, food booths, antique stores, art exhibits, Old City Hall Exhibits, pet adoptions, and music at the Old Train Station. Enjoy a night at the fair with your family complete with carnival rides, music, entertainment, food, and exhibits. Browse and meet with various arts and crafts vendors in Gonzales. Find your perfect pumpkin at this patch. This sweet celebration features food, history information, folklife demonstrations, a sweets contest, music, performances, and exhibits. Includes games, weekend hayrides and face painting, pumpkin bowling, fall scenes for photos, pumpkin decorating, and food and drinks. Parents and their kiddos are invited to come dressed in their costume of choice for a spooktacular event. There will be a children’s village for ages eight and under including carnival games, costume contests, character visits, arts and crafts, and karaoke in the amphitheater. Music, food, a Louisiana Craft Fair, cooking demonstrations, a sports tent, paddling the Tour Des Atakapas and a La Place des Petits, an area just for children with arts and crafts. Pumpkin patch includes a Party in the Patch on Saturday, October 13 with a Picnic in the Patch on Friday, October 28. Also on October 28, there will be three escape rooms. Pageant, live music, jambalaya and cracklin’ competitions, and family activities. Designed especially for younger children as an alternative to haunted houses, Swamp Haunted Hikes allow you and your children to trek through the Swamp Graveyard Maze to enjoy carnival games, face painting, and make-and-take crafts. Enjoy trick-or-treating and a petting zoo at Boo at the Barn. The cost is $1 or one canned good to enter, with proceeds going to local Thanksgiving baskets. There will be plenty for your kids to enjoy, including farm-themed games, a pumpkin patch, face painting, and inflatable horse races. Includes artists and vendors, boat building, and entertainment. Provides quality family entertainment including exhibits, Old McDonald’s Farm, and activities. Features arts and crafts, food, a pageant, and cooking contests. Bring the dog and the entire family to this dog-friendly Trick-or-Treat event. Local pet organizations will be in attendance distributing valuable information, candy for the kiddos, and treats for the dogs. You can dress up your dog for the Best Costume Contest as well. Enjoy a day with your family indulging in food, great music, fun games, and amusements. Dance for children ages 16 and up with special needs and their friends and families. Trick-or-treat at historic houses, play vintage games, and enjoy hauntingly good live music on this exciting evening. Grab your treat bags and head to the Zoo for this merry-not-scary trick-or-treating extravaganza. Wear you best costumes and visit treat stations throughout the Zoo. Enjoy this free Halloween festival with your family featuring music, entertainment, food, and children activities. Delve into the eerie side of astronomy, physics, and aeronautics with creepy science demonstrations during HRPO’s annual tribute to the bizarre and freakish. Don’t forget the campfire stories, strange sky phenomena, extra dimensions, and extraterrestrials. There will be contests with winners being named for: Best Trunk, Best Costume, and Most Unique Carved Pumpkin. There will also be the UUMC World Famous Chili Cook-Off that will leave your mouth watering, face painting, and “Minute-to-Win-It” games. Enjoy rides, drone races, food, and live entertainment. Includes trick-or-treating, a fishing tournament, rides, talent & car show, live and silent auctions, St. Amant High’s 5K Color Run, and food. Get in the Halloween spirit by paddling in the dark along the shoreline of the University Lakes. Dress in a costume and add some lighting to your watercraft to light up the night as you paddle along. Prizes will be awarded for the best decorated boats. Children can go door-to-door to all of the sorority houses to receive sweet treats in this fun trick-or-treat event. Houses will also have crafts, face-painting, and photo booths. This annual extravaganza is a safe, fun-filled Halloween event for children up to age 12. Featuring trick-or-treat houses with candy, a Ghost Train, a haunted house, games, and entertainment. Relax on the lawn at Farr Park with your family to enjoy a screening of Hocus Pocus. But first, you and your kiddos can take a hayride through the haunted park. Costumes are encouraged. Watch a fun Halloween movie starring a young boy named Miguel. Watch Halloweentown with your kiddos in this unique movie experience. Enjoy indoor seating during BREC’s monthly free film series. Family-friendly event with treats, music, arts and crafts, face painting, a princess meet and greet, and a children’s costume contest. 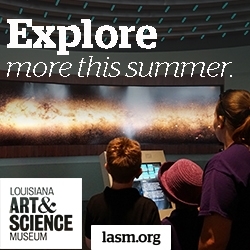 Combines Harry Potter with astronomy and art, with themed activities ending with a live presentation of The Astronomical World of Harry Potter at 5 p.m.
We all love a great parade in Baton Rouge! This year, the Greater Baton Rouge Food Bank will lead this “parade with a purpose” as they will collect non-perishable food donations straight from the crowd. Parading krewes, dancers, and bands will entertain the crowd with incredible costumes and candy throws, and there’s a special place along the route that is scare free. There will be activities the entire family can enjoy on this beautiful fall day. There will be carnival games, Trunk-or-Treat, laser tag, an escape room, balloon animals, inflatables, activities for special needs children and food trucks. The Southern Mud Riderz annual ATV event includes a meet and greet ride, mud bog races, costume contests, decorating contests, trick-or-treating, poker run, bounty hole challenge, a silent auction, and a bonfire. Includes acrobats, princesses, puppets, pumpkin painting, games, a children’s costume parade, and a pumpkin pie eating contest. Meet local authors, hear sounds from local musicians, check out the books for sale and enjoy free food. Makers’ booths, produce, food and music. Children can also participate in booth-to-booth trick-or-treating. At this family-friendly event, you won’t find anything spooky or kooky. There will be a bonfire, s’mores, live music, and glow-in-the-dark games. Be sure to wear your costume. Admission is $10 per person. Children ages three and under are admitted free. Starts with a a Lil’ Pumpkin one mile fun run followed by the Pumpkin Pi 3.14 mile race and a Tough Pumpkin Challenge. Rides, talent show, raffles, store, sweet shop, food, music, and 5K and fun run. Don’t miss out on this annual arts and crafts festival. Be sure to grab a fish dinner ahead of time before participating in games, jumping on inflatables, and checking out auction items. Saturday, October 27 from 5-6 p.m.
You have to run to stay alive in this adrenaline-pumping race. Runners not only have to make it to the end of the course, but they will also have to avoid the undead as they scurry along. Ages 16 and up. Food, kids’ games, bingo, raffles, sweet shop, auctions and music. With the sights, sounds and activities of an old fashioned country fair, Haints, Haunts and Halloween will include storytelling, face painting, wagon rides, and historic games for all to enjoy. This event concludes with a safe and scenic venue for trick-or-treating with old fashioned treats. Enjoy free games, food, inflatables, and trunk or treat. Get dressed up in your costumes for this entertaining Halloween experience. Enjoy the themed recreational games and tour the Haunted House, if you dare. Food, balloon artists, inflatables, games, face painting, and a haunted house. Have a hauntingly good time with your friends and family at Howell-O-Ween. Activities will include trick-or-treating, ghoulish games, and a hair-raising haunted trail. Food, games, activities and door prizes. Free. Indoor Halloween activities with vendors, bounce houses, carnival games and an isolated haunted house. Dress in fun attire for free candy.